PT Hanjaya Mandala Sampoerna Tbk - PT HM Sampoerna Tbk (IDX:HMSP) or referred to as "HM Sampoerna" is an Indonesian public-listed company with core competencies in tobacco industry. 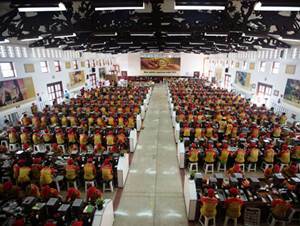 HM Sampoerna is recognized as a prominent player in tobacco industry in Indonesia. As of December 2015, HM Sampoerna maintains about 35% market shares in the domestic tobacco market. HM Sampoerna is a local subsidiary company of multinational tobacco giant Philip Morris International Inc (PMI Group). HM Sampoerna’s shareholders are PMI Group (through PT Phillip Morris Indonesia) and general publics, respectively 92.75% and 7.25%. HM Sampoerna is based in Surabaya East Java and now has 7 manufacturing facilities and also supported by 38 Third Party Operators (TPOs) throughout Java. In term of financial performance, HM Sampoerna posted positive financial performance in 2015. According to HM Sampoerna Annual Report 2015 as cited by JobsCDC.com, HM Sampoerna reported total net sales of Rp 89,069 billion in 2015. This reflected an 10.38% increase from the previous year of Rp 80,690 billion. At least 2 years of work experience from various backgrounds. Detail oriented and achievement oriented. Strong sense of analytical thinking and good communication skill. Willing to work in field and to be located in all over Indonesia. JobsCDC.com now available on android device. Download now on Google Play here. Please be aware of recruitment fraud. The entire stage of this selection process is free of charge. PT Hanjaya Mandala Sampoerna Tbk - Recruitment Commercial Leader HM Sampoerna October 2016 will never ask for fees or upfront payments for any purposes during the recruitment process such as transportation and accommodation.